We speak to inspiring communicators regularly. In fact, CharityComms hosts over 60 events a year, where we invite a diverse group of people to share insights, campaign successes and battle stories with our network. We know our members love our events, because you consistently rate them so highly. But we wondered, could we do more to bring that expertise to more people in new formats? After an inspiring talk about podcasting at one of our events by our now trustee Clive Gardiner and the RNIB’s own radio host, Steven Scott; the resurgence of podcasts in general; a membership poll with loads of you asking us to do a podcast; and the fact we’re both major podcast fans, we decided this was a format we had to explore. Over the last year, we’ve been researching, recording and editing content to start a podcast. It’s meant gathering as much info as possible, working things out on the go and being brave. 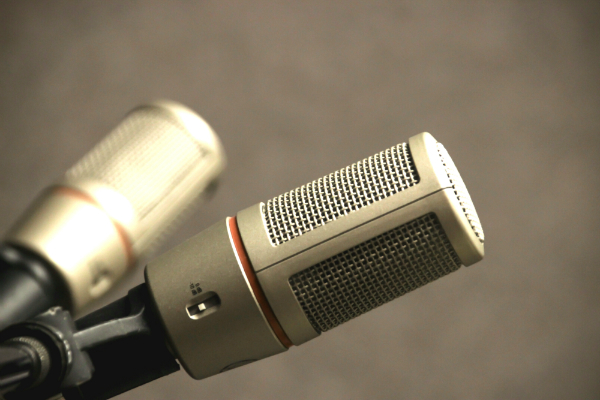 We’re pleased to finally publish the first episode of the CharityComms podcast today! Listen on AudioBoom from your desktop or download from Spotify or from the podcast app on your iPhone. Because we’re brimming with content, we’ve split our first episode into two halves. In this first half, we hear from two digital disruptors who are challenging the digital content myths that are all too easy to get caught up in. Jon Ware, previously the digital lead at Anthony Nolan, popped into our office to tell us about shifting the charity’s approach to social media strategy, while Chris Flood joined us to talk about why content is not king and why you need to think about user experience to build meaningful products and services for your communities. In part two, we’re joined by Brani Milosevic and Zoe Amar, two freelance consultants who have lots of experience challenging third sector organisations to take up the challenge of digital transformation. Part two will be out shortly and we’ll be sure to let you know as soon as it’s available. Because we’re a tiny team working around a hectic events schedule, we’re not entirely sure how frequent we’ll be publishing the podcast yet, but will have a good idea soon. Thanks to everyone who helped make the podcast happen, we couldn’t have done it without you. From Harriet Smith who gave Robyn the time to innovate in her role to Adeela Warley who backed the project; Clive Gardiner and Steven Scott for their free advice and words of encouragement; our first podcast guests, Chris Flood, Jon Ware, Zoe Amar and Brani Milosevic for bearing with us as we work out how to use the microphones; we’re grateful for your support, encouragement and expertise to make our pilot episode a success. If you’re thinking about podcasting at your charity, check out this article on charities who podcast. We’re also keen to hear from people who want to get involved, so drop us an email or tweet us! Listen to the first episode on AudioBoom from your desktop or download from the podcast app on your iPhone. If you need a copy of the full transcription, you can find it here. Before Robyn came on board with CharityComms, she studied an MA in gender studies at SOAS. Outside of working hours, Robyn volunteers with the Schools Consent Project, working on its social media channels. Sushi joined Scope in October 2018 to support retention of Scope's monthly subscription product, Mindful Monsters, an exciting way for families to explore mindfulness. She previously worked at CharityComms and continues to host the CharityComms podcast with Robyn. Sushi has worked with various charities and non-profits for the past eight years, specialising in digital communications and supporter journeys.